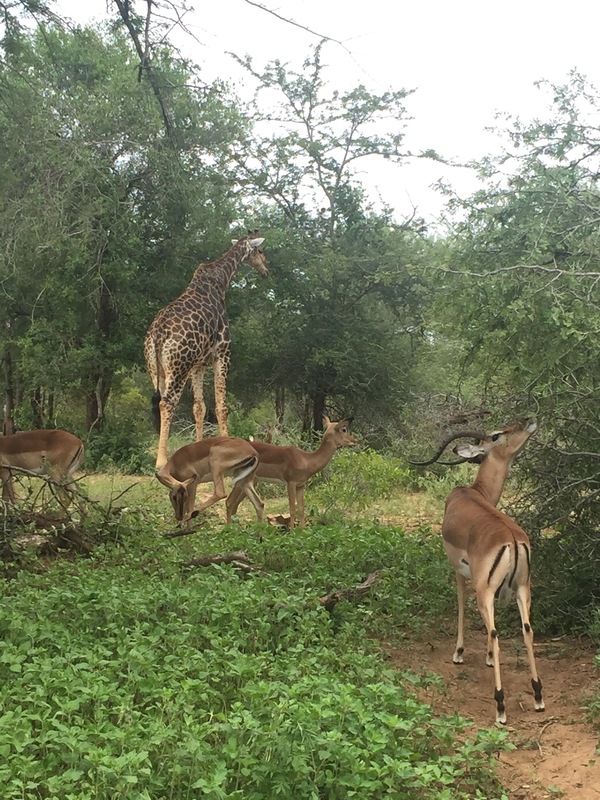 Kruger National Park | Cheer Up! Posted on October 14, 2015	by Mimi G.
One of the best known wildlife sanctuaries in Africa is Kruger National Park, near Johannesburg, the capital of South Africa. 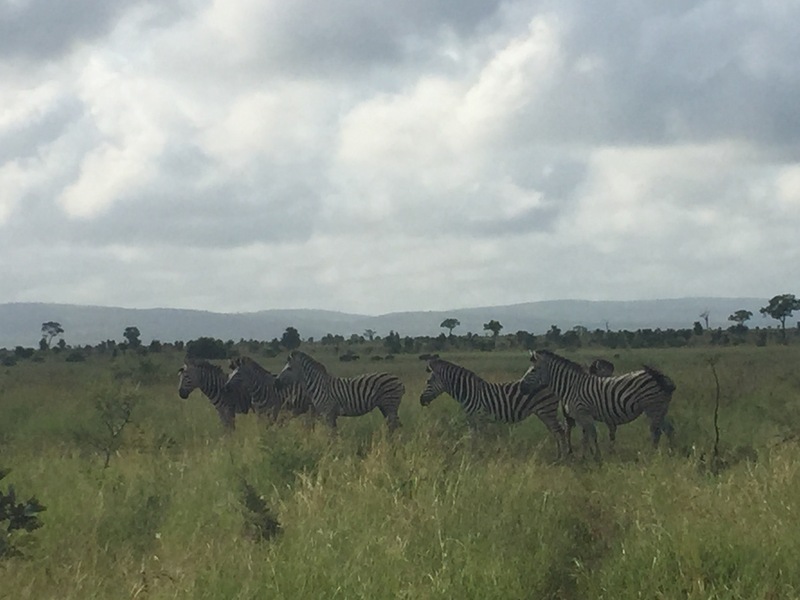 The drive from Jo’burg to Nelspruit (the gateway to Kruger National Park) is a pleasant one, along broad smooth roads, flanked by rolling hills. The rocky red soil is covered in tall grasses (the kind that lions are always pictured in) and trees — acacias, junipers and many others that I can’t name. That tree unique to arid areas, with a trunk like a stubby Moai statue, and a crown of spiky leaves, stands out amongst them. There is an occasional sugarcane field or pawpaw orchard, and once, a herd of grazing springbok. Getting into Kruger National Park, we have more than our fair share of luck. 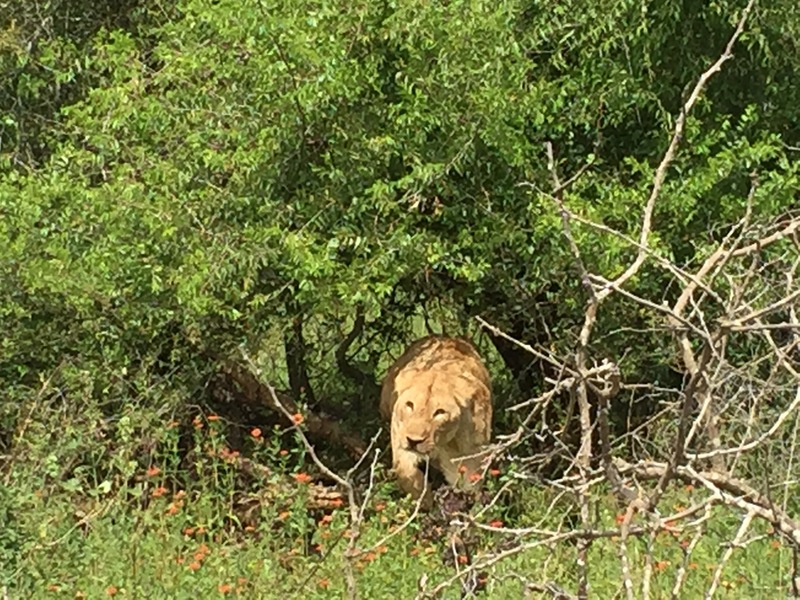 Within 5 minutes, we encounter a pride of lions under a bush not 10 feet from the road. We hear a pair mating, their throaty “Aarooms” splitting the still afternoon. Then three more lionesses and another young lion run up to join them. Afterwards, they settle down to a prolonged and audibly bone-cracking meal of (possibly) wildebeest. This is followed in rapid succession by sightings of many, many other animals – Kruger, which, at 25 million hectares, is the size of a small country, is teeming with wild life. Impalas are the most common sight, large herds of them grazing unconcerned close to the road, or kicking up their back heels to leap off into the green cover, Zebras stand in small groups, stark and picturesque against the green and yellow grass. The long necks of giraffes stand out against the horizon as they browse on the tallest trees. Aptly named umbrella trees and sausage trees dot the landscape, and pretty roller birds flash their soft teal and dusty pink plumage at us. 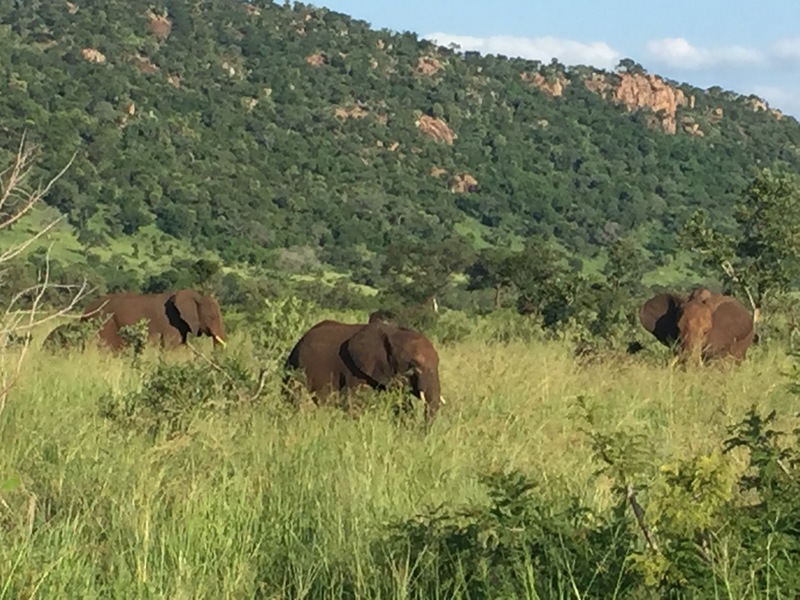 After lunch we come across veritable riches of elephants – from babies to venerable old gentlemen with huge tusks. The teenaged males often fight, knocking tusks together, one pushing another backwards. Sunset brought us groups of hippos mostly submerged in a pool, and a group of wild buffaloes lounging by the sandy river bank, looking far from the dangerous animals they are. I am reminded of Gerald Durrell, my favorite naturalist, who wrote of animals with such love and unassuming humor that he inspired an answering love of animals in his millions of readers, myself included. The two days next day, we see many more of the same animals, and some new ones. A hyena slinks away down the road in front of us. The shy kudu antelopes, with white stripes across their dark brown backs, allow us to admire their gracefully twisted antlers, and once we glimpse bushbucks. We see families of baboons and vervet monkeys, arraigned along the branches of a low, leafless tree. Wildebeests, or gnus, prance around, shaking their horns and beards, and warthogs root in the red soil. 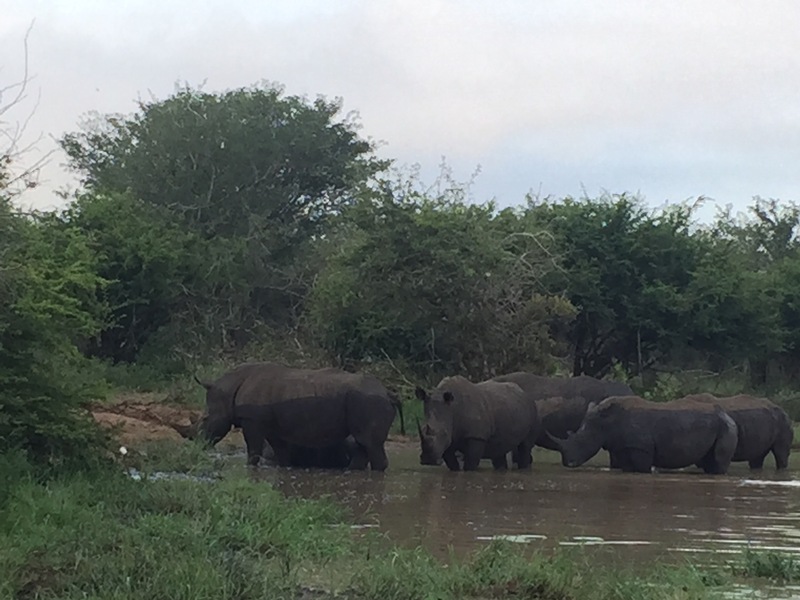 Rhinos wade in muddy waters, or chomp at the short grass, looking cross and wrinkly as ever. Eagles sit fearlessly on treetops, vultures circle overhead is the distance, hornbills crack their long curved yellow beaks, starlings and swifts flit by, and a bee-eater shows off its long lovely tail. A kingfisher observes a smiling hippo enjoying a jacuzzi in the river rapids. We often stop the jeep for wildlife, big and small – leopard tortoises crawling across the road, guinea fowls scurrying away, huge elephants with their giant tusks gently reminding us who is boss, a large lion pacing the road with his mane fluffed out. Once we take a bushwalk, with guides carrying serious rifles, and see a half-eaten impala carcass hanging from a high branch where a leopard dragged it, leaving bloodstains on the tree trunk. At night, we sit by the campfire, and I study the unfamiliar constellations of the Southern Hemisphere — the only one I know is Orion, listening to the sounds of the forest. This entry was posted in Travel and tagged Africa, Kruger National Park, Safari, South Africa, Therapy, Wildlife. Bookmark the permalink. Wow! This is now on my bucket list for sure!